TBS Consulting was founded by Richard Turner in 2006 and boasts an extensive and prestigious client list throughout Australia. Diversity and integrity are the cornerstones of our proven track record in all aspects of Vocational Education and Training. Specialising in RTO registration support, assessment design and compliance systems. Richard Turner, Director of TBS Consulting has been an owner and manager of RTOs since 1996 and understands the evolution of the training sector. This means Richard will work with you, avoid meaningless jargon and focus on current and relevant best practice. He will speak your language when discussing the needs of your training business. Richard’s communication strategy is to, first and foremost – listen. Richard’s goal is to coach and empower you and your team to achieve a business culture of continuous improvement and professional development. The ongoing viability and sustained growth of our clients is foremost in the business philosophy of TBS Consulting. Please take a few minutes to review our testimonials, read the Director’s Profile and compare our products and services. Based in Brisbane, we specialise is servicing Brisbane, South East Queensland and regional Queensland. 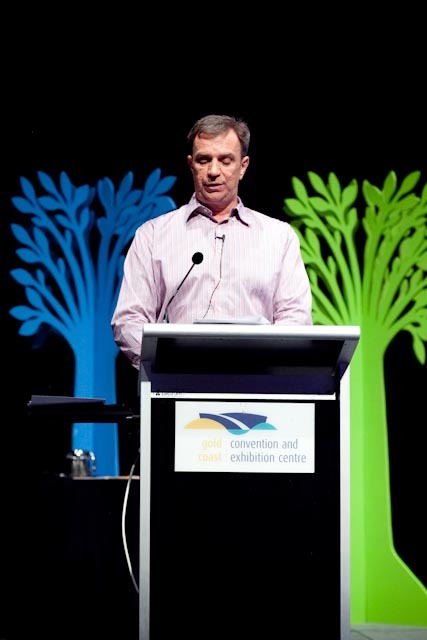 Richard Turner presenting to an audience of approximately 250 delegates at the VELG Training National Conference. Gold Coast Convention and Exhibitions Centre.